Coach John Marinelli talks with his players on the first day of practice for the Greenwich High School football team on August 17, 2018 in Greenwich, Connecticut. Coming off the biggest win of the season, the Greenwich football team is feeling good after trouncing New Canaan 42-14 last week. While the No. 2 Cardinals would love to ride the momentum from that important victory into a game this week, the team is instead spending their time lifting weights, watching game film and doing yoga as part of their bye week. For Greenwich coach John Marinelli, the bye could not have come at a better time for his squad. The state-mandated bye weeks were met with some hand wringing when introduced in 2015, but after a few seasons, teams are figuring out how to use the time off to their advantage. The moaning by coaches in 2015 that the bye week would somehow ruin the sport locally have never proven true with most now embracing the break. 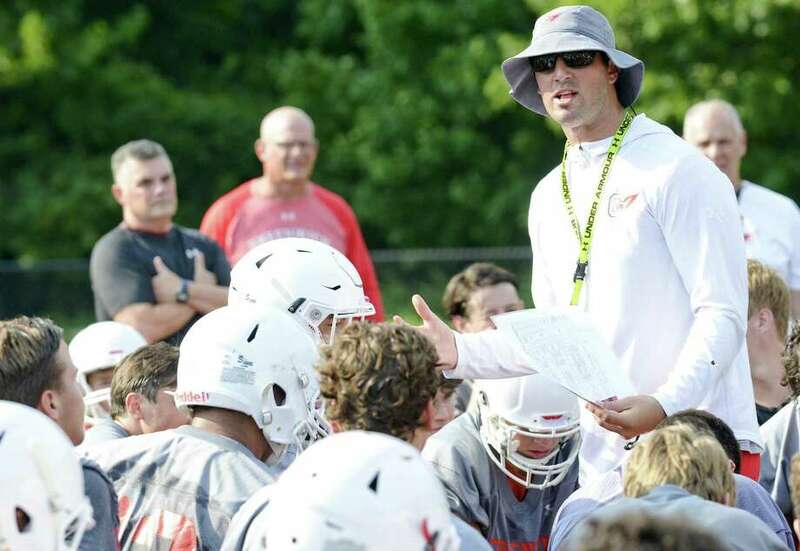 The CIAC implemented the bye-week rules to help prevent serious injuries, most notably concussions and to give players a respite during the season. During the bye weeks, teams are not permitted to practice in pads or conduct full-contact drills. The bye coming at essentially the midpoint of the season has let coaches hit the pause button, take a breath and work on little things which may get glanced over during a normal practice week full of game-planning for opponents. Most teams in the SCC and SWC had their byes last week while the FCIAC is in its bye week currently. That time off allows players battling injuries to recover without missing further game action and for those with the usual bumps and bruises associated with football to have a week without physicality. With the SWC and SCC both having byes last week, coaches have been able to witness a renewed energy in players returning to full-throttle practice Monday. Going into the bye coming off a win is always nice, but coming off your first win as a head coach, gives teams time to enjoy the victory while still leaving time for preparation. Westhill coach Joe DeVellis won his first game as a head coach 32-12 over Capital Prep/Achievement last weekend. As a first-year head coach, DeVellis is still trying to figure out how best to use the time during the bye week, but said he is glad it came after a win rather than a loss. The bye weeks are here to stay and as more coaches come around to finding good use of the time off, the complaints about the week with no games is fading into the night.